Sharp To Exhibit High Volume Multifunction Printers At PRINT 17 | Industry Analysts, Inc.
MONTVALE, N.J., Sept. 7, 2017 /PRNewswire/ — Sharp Imaging and Information Company of America (SIICA), a division of Sharp Electronics Corporation (SEC) is pleased to announce its participation in PRINT 17, where it will highlight the Sharp MX-6580N and MX-7580N high-speed color document systems with an optional MX-PE12 Fiery® Print Server. The two new additions to Sharp’s high-volume color multifunction printer (MFP) lineup are ideal for professional printing and color-critical environments. The MX-6580N and MX-7580N print 65 and 75 pages per minute, respectively, and are equipped with the latest Sharp OSA® technology. This enables easy integration with network applications and cloud services, including Cloud Connect for popular platforms such as OneDrive®, Google Drive™, and SharePoint® Online. The optional MX-PE12 Fiery Print Server provides unsurpassed job and color management, while working seamlessly in environments requiring more control and precision color output. Complementing Sharp’s world-class support on the pre- and post-sale side, all Sharp Print Production Managers have earned the Fiery Certified Expert title, the highest level of training attainable through EFI, which provides direct access to EFI support engineers and helps to guarantee the best possible support to Sharp’s customers. This training and support is critical for light production and Fiery-connected environments, where productivity and up-time matter most. During PRINT 17, attendees can stop by the Sharp exhibit to speak with a Sharp Print Production Manager, where they will be answering questions and providing demos on the newest products. For those customers not requiring a Fiery print server, the MX-6580N and MX-7580N standard print controllers now include Pantone Licensing as part of Sharp’s continued focus on color matching. These models add to the long list of MFPs offered from Sharp that are Pantone licensed. Through PANTONE® Color Matching, Sharp MFPs are easily able to reproduce colors from the PANTONE Coated Series of colors without the expense or required expertise that sometimes comes with optional software or hardware. There are now a total of 14 current Sharp color models with this capability, including the new models. Users will also benefit from the mobile printing capabilities the MX-6580N and MX-7580N have to offer. Mobile scanning is available via Sharpdesk Mobile, and connectivity is available via mobile printing supported platforms such as Apple® AirPrint®, Google® Cloud Print™, and native Android™ printing. A no cost server-less print release option allows users to release a job from another capable Sharp MFP without needing a server or extra software. Sharp is exhibiting at PRINT 17 in the Formax booth #3625, September 10-14, in Chicago, Illinois. Sharp Electronics Corporation is the U.S. subsidiary of Japan’s Sharp Corporation. Sharp is a worldwide developer of one-of-a-kind home appliances, networked multifunction office solutions, professional displays, robotics and energy systems. Sharp Imaging and Information Company of America, a division of Sharp Electronics Corporation, markets the advanced, MX Series multifunction printer (MFP) systems that help companies manage workflow efficiently and increase productivity. 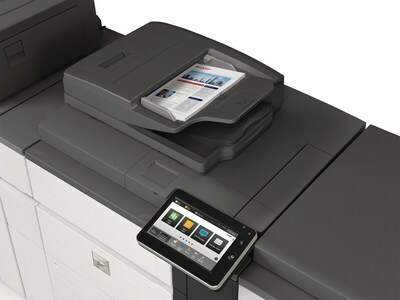 As a leader in security within the MFP industry, Sharp MFPs feature the Sharp OSA® development platform, which seamlessly integrates network applications to create a personalized MFP that can meet virtually any business need, and Scan2 technology, which scans two-sided documents in a single pass to enhance scanning reliability and preserve document integrity. This entry was posted in Sharp and tagged Print 17, Sharp by IA Staff. Bookmark the permalink.